South Korean electronics giant Samsung will reportedly challenge the $120 million in damages awarded to Apple as part of the companies' most recent courtroom battle, with Samsung's lead attorney saying the verdict was "unsupported by evidence." "Of course we're pleased that the jury awarded Apple 6 percent of what they were asking for," Samsung attorney John Quinn said in a statement obtained by Bloomberg. "But even that can't stand, because Apple kept out all the real world evidence and didn't produce anything to substitute for it, so you have a verdict that's unsupported by evidence —and that's just one of its problems." Apple had asked the court for more than $2 billion after alleging Samsung infringed on five patents— including swipe-to-text, universal search, and data detectors —while a Samsung counterargument sought just over $6 million for two patents of its own. 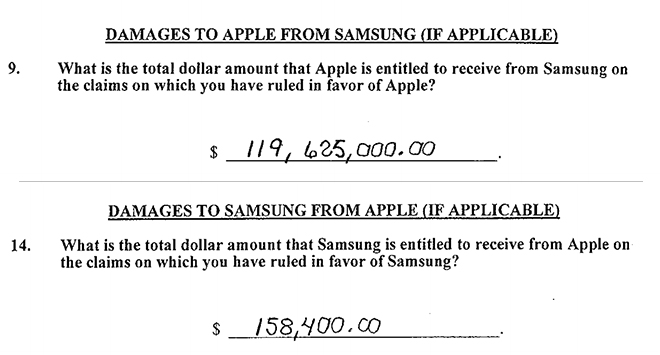 A jury found both parties guilty of infringement but ordered Samsung to pay just $119.6 million and Apple to deliver only $158,000 to its rival. Following what was described as a "clerical error" that left Samsung unpenalized for at least one infringing handset, the jury subsequently revised individual payouts but left the total award unchanged. Appealing the verdict would be a sound financial decision for Samsung, according to Villanova University law professor Michael Risch. "At this stage an appeal is cheap, even if the total can be reduced by $10-$20 million," Risch said. Samsung has already lost more than $900 million to Apple after falling in two previous lawsuits. An unsuccessful appeal of this most recent skirmish would push Samsung's total losses to the iPhone maker over the billion dollar mark.